In September 2007, after Shinzo Abe had abruptly quit his first stint as prime minister, sales of Shin-chan Manju, a bean-paste-filled bun named after Abe, spiked. The maker of the buns had tried to promote the product over the course of Abe’s year as the Liberal Democratic Party leader, changing its name in line with the prime minister’s evolving vision of a “beautiful Japan,” but the buns never sold very well — that is until he resigned. The sudden interest in the confection was simply a register of its commemorative value. It made a nice “keepsake,” as one buyer told Kyodo News at the time. Popularity was attached to the “event,” not the “character.” Something similar can be said about the success of Kumamon, the official mascot of Kumamoto Prefecture, who also overcame an initial lack of interest. One of thousands of mascots created during the initial yurukyara (soft character) boom of several years ago, the smiling black bear (kuma) is credited with bringing the prefecture ¥11.8 billion in revenues in the first six months of 2012 alone, after drumming up only ¥2.56 billion in all of 2011. Kumamon promotes thousands of Kumamoto products, the vast majority food-related, and he has 120,000 Twitter followers. In a prefectural survey of local companies, 90 percent said they believe Kumamon significantly boosted their business. 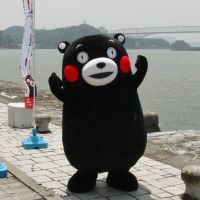 As a personification of a local government’s image, Kumamon is similar to former Miyazaki Governor Hideo Higashikokubaru, whose likeness also helped sell thousands of local products during his term, but Higashikokubaru’s image was cultivated over many years as a nationally known comedian. What is Kumamon’s secret? The character was created in March 2010 and looked much the same as it does now: black with incongruous red cheeks and a disconcerting smile enhanced by staring eyes. To say that Kumamon looks nothing like a bear is saying nothing, really — does Mickey look anything like a mouse? — and that’s part of the appeal of yurukyara. The artlessness of the design was not intended at first. It was merely a function of the desperate financial situations of most local governments. They could not afford to hire professional artists to create mascots, so they had someone with a flair for cartoons in the planning department sketch something or, more likely, held a public contest for a design. Now that yurukyara are big business, real artists endeavor to make their character proposals look as if they were not made by real artists. In the beginning Kumamon was not popular. According to a recent article in the Asahi Shimbun, children used to “run in the opposite direction” whenever he appeared in public, frightened by the character’s wall-eyed expression. Some experts theorize that it was the evolution of the bear’s physique from skinny to pear-shaped, along with the attendant change in Kumamon’s carriage, that did the trick. His movements are now more actively comical. One professor, an expert on “contents business theory,” told the Asahi that Kumamon has the power to “heal” the psyches of a stressed-out society. But before you exchange your anxiety pills for a stuffed Kumamon doll, understand that the real boost to Kumamon’s fortunes followed his official certification. In November 2011, Kumamon won the Yurukyara Grand Prix. Prior to this victory, he was averaging between 100 and 200 product endorsement deals a month. In February, he scored 640, and the number has been rising ever since. So even if you attribute Kumamon’s Grand Prix to better design, subsequent earnings are directly related to the huge media coverage. The governor of Kumamoto has said that Kumamon “wasn’t cute” before his makeover, but, objectively speaking, he still isn’t cute. The point is he’s a winner, which means he gets attention. And attention isn’t always dependent on winning. Last year, a 28-year-old freelance programmer, who remains anonymous in all the articles written about him, invented a game for mobile devices in an attempt to improve the reputation of his home prefecture. Gunma, this man noted, repeatedly placed last in national surveys about prefectural recognition. It seems that most Japanese have no idea where Gunma is or why anyone would ever want to go there. The game, called “Gunma no Yabo” (“Gunma’s Ambition”), involves “harvesting” negi (long onions) and konnyaku (devil’s tongue), two local crops, and gaining a kind of currency called “gunmers,” with which the player can acquire other prefectures. In the hands of a skilled player, Gunma not only conquers all of Japan, but takes over the universe. It’s the ultimate underdog usurpation. And totally absurd, which is why the media covered it with such gusto. The game went on sale in May and by August the programmer had sold 700,000 downloads, a new record. Success was so fast that it prompted another programmer from the prefecture next door to whip up “Tochigi Backlash,” a name that has no meaning to most Japanese, but in relation to Gunma has a lot of traction since the two prefectures have been rivals since time immemorial. The object of the game is to take the universe back from Gunma. In fact, “Backlash” goes “Yabo” one better by employing Tochigi’s own official mascot, Marukun, with the full permission of the local authorities, thus giving the prefecture an added component of recognition it can actually use. It’s doubtful that either game will bring as much revenue to its prefecture as Kumamon has to Kumamoto, but it proves that local governments have to be doubly creative if they want to attract attention, and not just from the rest of their countrymen. 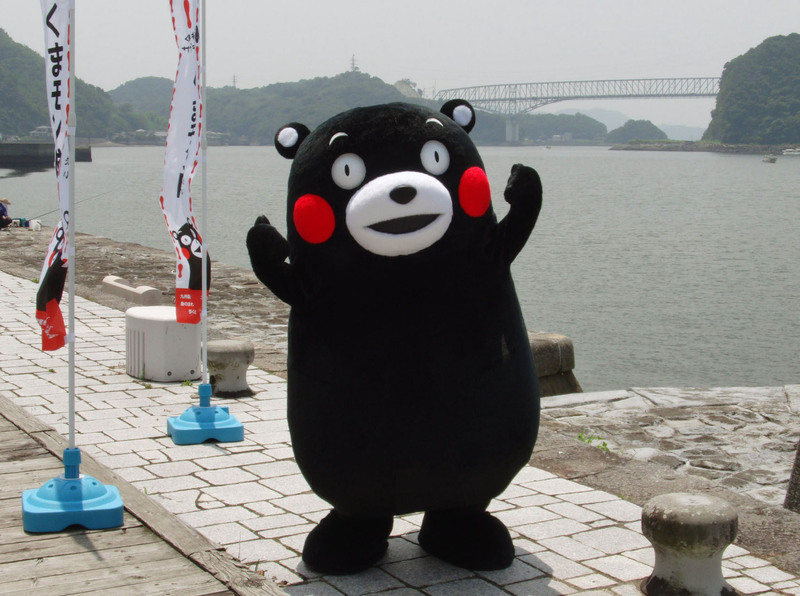 Kumamoto has set aside a ¥180 million budget this year for Kumamon, whose new task, according to the governor, is “to become beloved in China.” Who needs a new prime minister when you have a bug-eyed black bear with a funny walk?